Maps of the Corinthia are surprisingly rare via the internet, let alone maps of the ancient Corinthia. A google image search on “Korinthia” or “Corinthia” turns up two dozen very coarse road maps of the northeastern Peloponnese mainly produced or posted by tourist agencies. I have added a new section of this website, Maps of the Corinthia, where I have posted some higher resolution maps of the Isthmus and Corinthia, the course of the diolkos, the Eastern Korinthia Survey, and a gazetteer of archaeological sites. This area will grow as I continue the digital work and if you would like to donate anything to the cause, I’d be glad to post it there. You are free to use these maps for the purposes of education and scholarly presentation, but not publication except by request. I have produced the maps posted on that page, but have made use of some of the GIS data entered as part of the Eastern Korinthia Archaeological Survey (1998-2002). Richard Rothaus, especially, and his Archaeological Computing Laboratory at St. 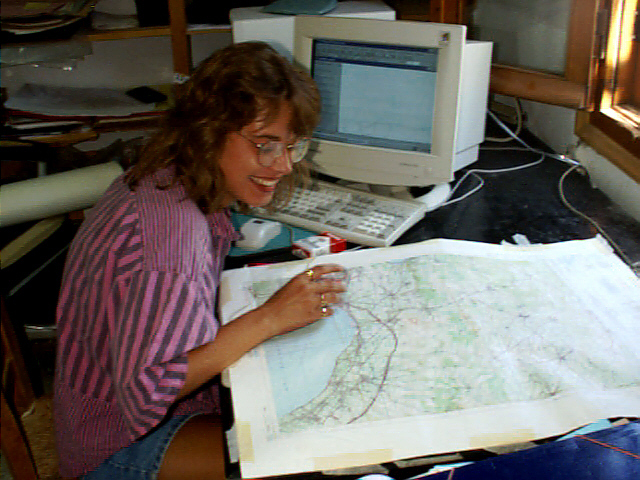 Cloud State University, conducted an enormous amount of work in the late 1990s in digitizing the Eastern Corinthia from 1:5,000 maps. They did it all manually via digitizing tablets (tracing the physical map itself), not via the heads-up digitizing (tracing an image on the computer screen) we use today. The Archaeological Computing Laboratory completed a ginormous labor of GIS: faults, streams, boundaries, settlements, topo lines, survey units, etc.. 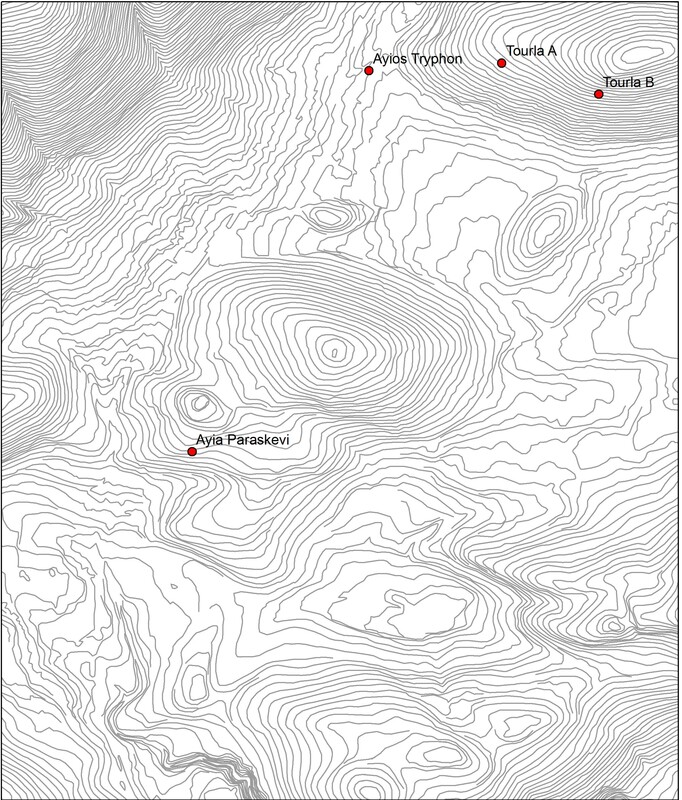 The elevation data alone is impressive: some 8,426 separate contour lines, and these are 2-meter contour lines, each requiring hundreds of clicks of the mouse. click..click..click. To show you one example, the following image displays the Eastern Corinthia with a dark mass of lines, the aggregate of the 2 meter contours. The red line follows one reconstruction (Salmon 1984) of the boundary of the classical Corinthia. 8,426 lines. 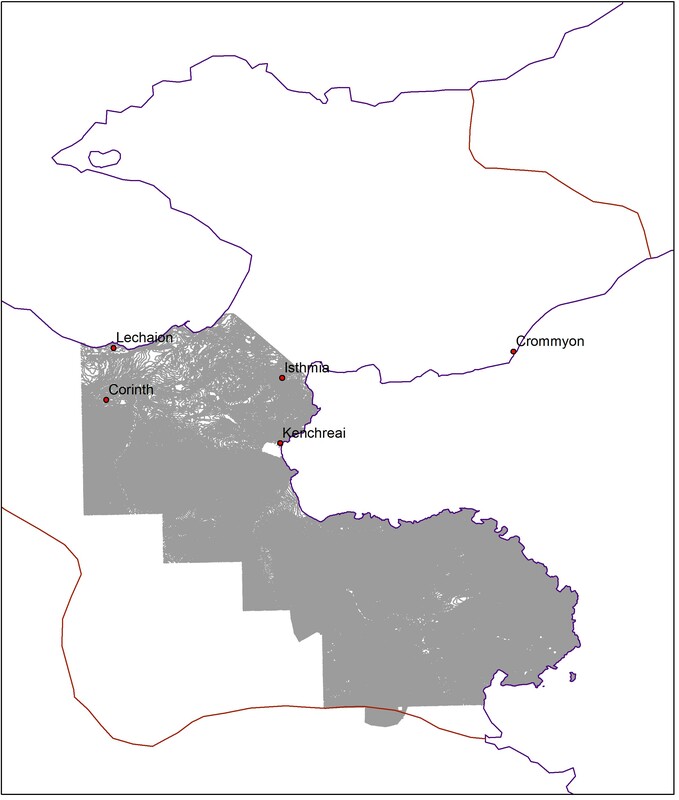 Since my main project is the Isthmus, consider the problem I encounter with the following image, which shows the archaeological sites of the Corinthia against its high resolution topographic background. Note where those topo lines stop. I am currently working on adding at least the topo data (20 m contours) from the other side of the Isthmus. But in the interest of time, I’ll be working from maps of larger scale, 1 to 50:000 rather than the 1:5000s. Watch for updates and maps as I make progress on this. Excellent, and thanks. I looked briefly this morning on the site but could not find anything. I’ll look again. Thanks! Sometimes we felt a little underappreciated, but its great to see the data out there and being used.